- The 2 pieces over the doorways are held on with plastic rivets and can be easily removed by pulling them apart with your fingertips or a small needle nose pliers. The other 2 pieces are simply held on by wood screws and can be removed with a small Phillips screw driver. 4. Install angled bracket (provided) by removing the existing nut #3. - Now, use wall piece # 1 and line up the top edges and use the wood screw (provided) to attach to playfield side and use 1/2" small screws to screw together wall pieces at the top of the L bracket. - Some adjustments may be required to fit evenly, the pieces are somewhat flexible and can be positioned properly if you take the time. 7. Lastly, the large wall piece # 5 is simply screwed into position using the wood screws (provided). Tip: after removing the original wall, put back the small screws it was held with half way, than, take the new wall piece and push against those screws, use the new 1" screws from the back side of the wall piece until they pertrude through the front. 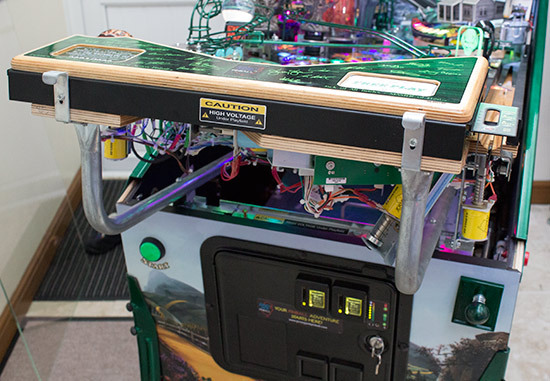 This will allow you to line up the holes exactly with the playfield. Install the witch's cage (if ordered) prior to installing piece # 5. - Check for all clearances prior to any game play to insure nothing gets in the way, these wall pieces are very durable and should last for the life of your game. The well piece is installed first with the two brackets (provided). Then the back wall piece is installed behind the witch. The large wall piece is installed last and is aligned with the witch’s wall where the crown of the large wall sits underneath the well wall to hide the sharp edge of the metal.